Upon their return from Europe and the Great War in 1919, the former soldiers of the 22nd Battalion met and formed the Battalion Association to keep alive the Anzac spirit and legacy of mateship that was forged on the beaches and cliffs of Gallipoli and which defined the Australian through the tough fighting in France and Belgium, and beyond. As the years have passed the legacy has now been past to the relatives of the men that fought within the Battalion, under the stewardship today of Ian Russell, son of 524 Pte Fred Russell, who held the position of Honorary Secretary of the Association from its inauguration in 1920 until his death in 1978. Each year the Association remembers those that served and marches on Anzac Day in Melbourne. In addition the Association produces an annual newsletter entitled the ‘22nd Battalion Association Echo’, taking the name from the publication of the same title that the Battalion produced on active service in 1918 until the troops returned home. The 22nd Battalion Association, together with other kindred active WW1 Unit Associations, will ‘step-off’ behind their Unit Banners from the assembly point on the north side of Flinders St. West, near Young & Jackson’s at 10.30am. Before the march 22nd Bn members and their families should assemble at 10.00am where the 22nd Battalion Banner will be located. WW1 Battalion Associations are now at the end of the march, not the beginning. To receive the annual newsletter, for further details on the Association or if you would like to become a member please send a message to Ian Russell via the form found on the ‘Contact Us’ page on the ‘Following the Twenty-Second’ website. 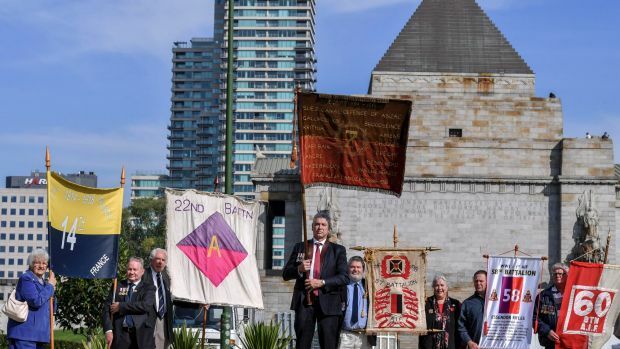 Honorary Secretary Ian Russell and the seven other WW1 AIF Battalion Associations with their banners outside of the Shrine for yesterday’s Anzac Day march. As with the previous year, the battalion associations had been controversially removed from the main veterans march, necessitating the need for the relatives to hold their own march, as described in the following video and article published in The Age. The first annual re-union of members of the 22nd Battalion Association took place at Sargent’s Cafe, Elizabeth-street, on Monday 29th September 1919 and was a great success, being attended by close upon seven hundred returned men and their relatives.